This seems to happen because it’s pretty hard for a lot of people to understand the concept of an API of which their team is both creator and consumer. I addressed this some time back in a post I wrote about building good abstractions and this post is sort of an actual field study instead of a contrived example. 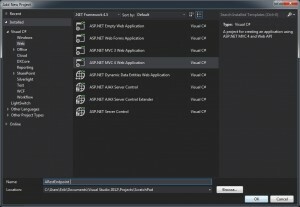 How do we know what makes sense to have in the application’s service layer? Well, write all of your presentation layer code assuming that you have magic boxes behind interfaces that cater to your every whim. If you do this, unless you have a pure forms-over-data CRUD app, you’ll find that your presentation layer wants different things than your repositories provide, and this is going to define your service level API. One thing you’ll notice straightaway is that my controller is pretty stripped down. It really just worries about the arguments to the HTTP methods, a terse summary of what to do, and then what to return or where to redirect. The only things that will make this more complex as time goes on are GUI related things — enriching the model, adding more actions, altering the user’s workflow, etc. This makes unit testing/TDD a breeze and it keeps unpleasantness such as “how to send an email” or “where do we get employees” elsewhere. But, most importantly, it also defines an API. Right here I’m thinking in the purest terms. I want to show my users a list of employees and I want to let them filter by department. I also want to be able to add a new employee. So, let’s see, I’m going to need some means of getting employees and some means of creating a new one. Oh, and the requirement says I need to send a welcome email in most circumstances (times I wouldn’t based on an elided GUI setting), so I’ll need something that does that too. Now, you’re probably noticing a serious potential flaw with this approach, which is that having a service that sends emails and fetches customers seems as though it will violate the Single Responsibility Principle. You’re completely right. It will (would). But we’re not done here by any means. We’re not defining what a service will do, but rather what our controller won’t do (as well as what it will do). Once we’re done with the controller, we can move on to figuring out appropriate ways to divvy up the behavior of the service or services that this will become. Right there in the controller’s source file, below it, I stick a dummy implementation of the service and I wire up the IoC to use it. This is really handy because it lets me simulate, in memory, the way the application will behave assuming we later define real, actual service implementations. So I can use TDD to define the behavior of the controllers, but then I can also use this dummy service to define the layout, appearance, and flow of the views using actual, plausible data. And all of this without worrying about data access or anything else for the time being. I’m bifurcating the application and separating (to a large degree) the fulfillment of user stories from the nitty gritty technical details. And, perhaps most importantly, I’m defining what the service API should be. I like having that dummy class there. It creates a warning for me in Code Rush (multiple classes in the same source file) that nags at me not to forget to delete it when I’m done. I can modify the GUI behavior right from the controller. As I add methods to the service while going along with my TDD for the controller, it’s easy enough to add implementers here as needed to compile. I consider this a win on my many fronts. And when I’m done with the presentation layer and satisfied, I can now look at the single service I’ve defined and say to myself things like “should this be more than one class?” or “is some of this functionality already implemented?” I’ve nailed the presentation layer and I’m ready to do the same with the service layer, knowing exactly what kind of API my ‘client’ wants. In my career, I’ve sort of drifted like a wraith among various technology stacks and platforms, working on web sites, desktop apps, drivers, or even OS/kernel level stuff. Anything that you might work on has its enthusiasts, its peculiar culture, and its best practices and habits. It’s interesting to bop around a little and get some cross-pollination so that you can see concepts that are truly transcendent and worth knowing. In this list of concepts, I might include Boolean logic, the DRY principle, a knowledge of data structures, the publish/subscribe pattern, resource contention, etc. I think that no matter what sort of programmer you are, you should be at least aware of these things as they’re table stakes for reasoning well about computer automation at any level. So even if you write kernel code or Winforms desktop apps or COBOL or something, I think it’s worth pausing, digressing a little, and understanding a very shallow-dive into how this thing works. It’s worth doing once, quickly, so you at least understand what’s possible. Seriously. Spend three minutes doing this right now. If you stumbled across this on google while looking for an introduction to Web API, skim no further, because here’s how you can create your very own REST endpoint with almost no work. With just these two tools, you’re going to create a REST web service, run it in a server, make a valid request, and receive a valid response. This is going to be possible and stupid-easy by virtue of a framework called Web API. 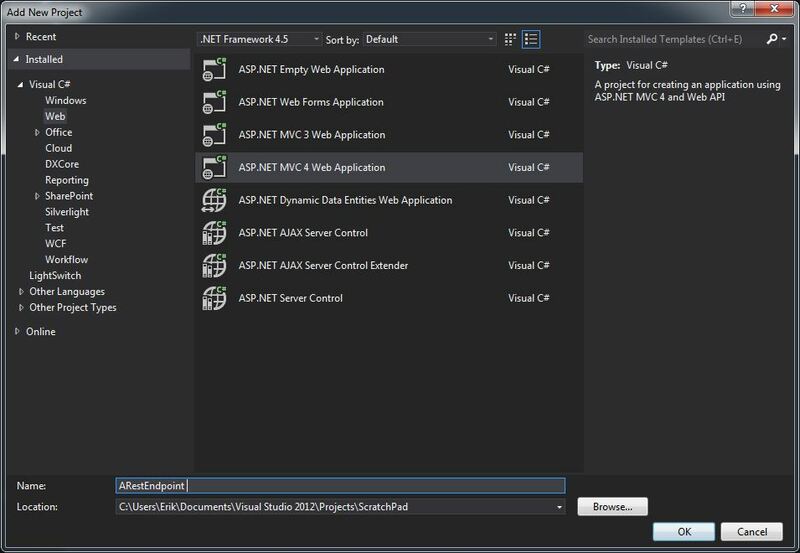 Fire up Visual Studio and click “New->Project”. Now, choose “Web API” as the template and click “OK” to create the project. Hit F5 to start IIS express and your web service. It will launch a browser window that takes you to the default page and explains a few things to you about REST. Copy the URL, which will be http://localhost:12345, where 12345 is your local port number that the server is running on. A 200 result will appear in the results panel at the left. Double click it and you’ll see a little tree view with a JSON and “value1” and “value2” under it as children. Click on the “Raw” view to see the actual text of the response. What you’re looking at is the data returned by the “Get()” method in your controller as a raw HTTP response. If you switch to “TextView”, you’ll see just the JSON [“value1″,”value2”] which is what this thing will look like to most JSON-savvy parsing tools. So what’s all of the fuss about? Why am I so enamored with this concept? Well, think about what you’ve done here without actually touching a line of code. Imagine that I deployed this thing to https://www.daedtech.com/api/values. If you want to know what values I had available for you, all you’d need to do is send a GET request to that URL, and you’d get a bare-bones response that you could easily parse. It wouldn’t be too much of a stretch for me to get rid of those hard-coded values and read them from a file, or from a database, or the National Weather Service, or from Twitter hashtag “HowToGetOutOfAConversation,” or anything at all. Without writing any code at all, I’ve defined a universally accessible “what”–a thing–that you can access. 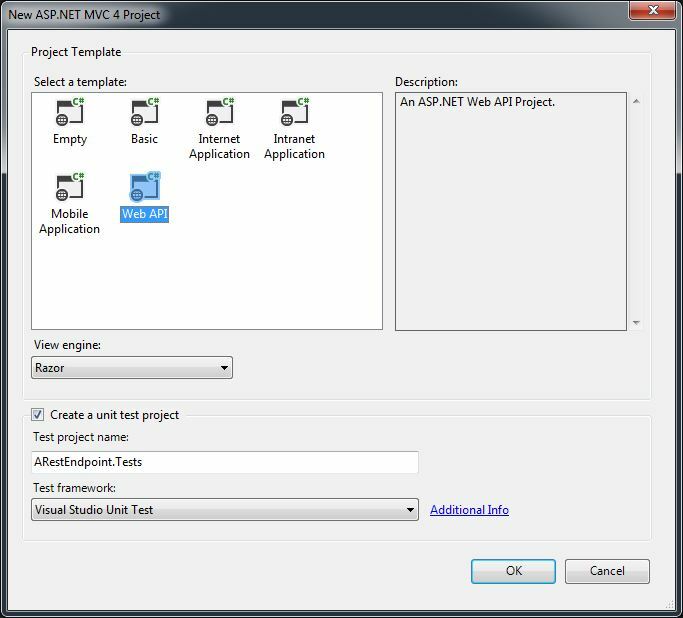 So take Web API for a test drive and kick the tires. 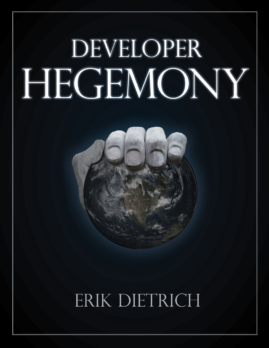 Let the powerful simplicity of it wash over you a bit, and then let your mind run wild with the architectural possibilities of building endpoints that can talk to each other without caring about web server, OS, programming language, platform, device-type, protocol setup and handshaking, or really anything but the simple, stateless HTTP protocol. No matter what kind of programming you do at what level, I imagine that you’re going to need information from the internet at some point in the next ten years–you ought to learn the basic mechanics of getting it.